The police force in Sokoto state has confirmed the death of a person killed on stray bullets when gunmen attacked Governor Aminu Tambuwal's motorcade on Saturday in Sokoto. The spokeswoman for the commander, DSP Cordelia Nwawe, told reporters that another person who was injured during the incident had been hospitalized. 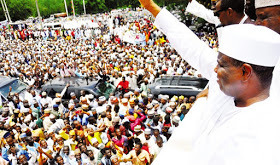 The Nigeria News Agency (NAN) reports that the PDP had organized a welcome rally to welcome Tambuwal following his failed attempt to secure the 2019 Presidential Ticket. NAN reports that the governor was received by a group of supporters at Sultan Abubakar III International Airport in Sokoto and walked in a motorcade to the government building. However, the event was not to be overheard as political thugs armed with dangerous weapons destroyed billboards, building constructions and vehicles bearing inscriptions from the opposition party. A car with the APC logo and a painting traveling from Bodinga to Sokoto was set on fire by mobs along Sokoto State University. The motorcade was then forced to stop along Gawon Nama, near Sen. Aliyu Wamakko's resident, as another set of mobs carrying arms confronted it. It took the security guards' efforts to get it going again. A relative of the deceased pleading for anonymity told NAN that the deceased, Imran Ahmad-Alkanci, was on his way home after visiting family members when the incident happened.